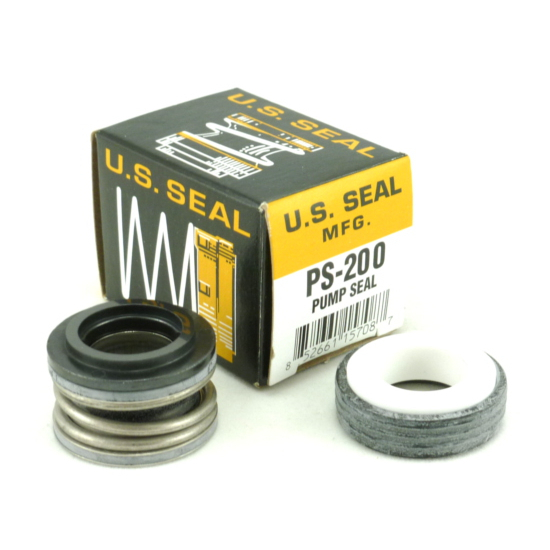 Genuine PS-200 US Seal replacement ceramic carbon shaft seal kit for all Aqua-flo pump wet ends used with Hot Tubs & Spas. The Ceramic part is installed on the inside rear of the wet end and the spring loaded carbon part is installed on the rear of the impeller shaft. The two parts when installed are spring-loaded to create a watertight seal between the Aqua-flo impeller and rear volute within the wet end assembly. No silicone is required as the ceramic part has a rubber outer to seal around the inside edge of the wet end rear volute plastic. To prevent premature wear of these seals avoid getting grit, dirt or grease on either of the two faces. This replacement Aqua-flo seal kit fits all Aqua-flo spa pumps such as Circ-Master HP, CP & XP, FloMaster XP2 & XP2e, FMCP and more.